Holocaust Survivors: Photo Gallery - "Hitler, Hess, Himmler"
Hitler, Hess and Himmler and others stand in front of the "Feldherrnhalle," the War Memorial on the Odeonsplatz, during a ceremony commemorating the eleventh anniversary of the "Beer Hall Putsch" on November 9, 1934. In 1923, Hitler made an abortive attempt to stage a coup d'etat in Germany. 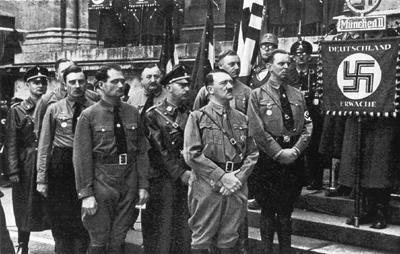 Year after year, Hitler met with the Nazi Alt-Kampfer, the Old Guard, to commemorate the memories of the martyrs. Hitler turned his trial for treason into a public relations triumph by accepting complete responsiblily for the Putsch while promoting himself as a German patriot. While in prison he dictated his political statement Mein Kampf, "My Struggle," to Hess. Hitler's own title for the book was "Four and a Half Years of Struggle Against Lies, Stupidity and Cowardice." After the Putsch Hitler resolved never again to try to seize power directly by force. Instead, he decided to seek power within the system by "legal" means. His methods included acts of intimidation and violence against political enemies.